There was a fine opinion piece in the LA Times yesterday noting the anniversary of the signing of the Social Security Act. The title was “President Barack Obama could learn from Franklin D. Roosevelt” and the author is Nancy J. Altman, who wrote the recently published history, The Battle for Social Security: From FDR’s Vision to Bush’s Gamble. You can read the entire piece here: http://www.latimes.com/news/opinion/la-oe-altman14-2009aug14,0,6660527.story. I knew that Frances Perkins had worked for the Consumers’ League of New York after receiving her Master’s degree in 1910. I had also known from reading Kirsten Downey’s biography, The Woman Behind the New Deal, that after retiring from her public service job in 1953, Frances had pursued teaching at Cornell from 1956-1965. However, I wondered what she was involved with after she had retired in 1953 but before she had begun her Cornell employment as a lecturer in 1956. I wondered about this missing link. 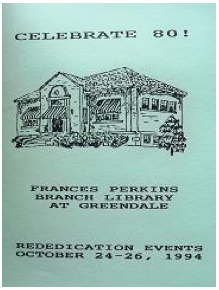 Last week, I came across a booklet from the Frances Perkins Branch Library at Greendale and it has helped me uncover this information about Frances’s career that has not been mentioned much in her biographies. Given below is the chronology of her achievements that was published in it. 1933– President Roosevelt appointed Perkins Secretary of Labor. She was the first woman in the cabinet. 1935– Passage of Social Security Act, the basis for which was a report of the Committee on Economic Security, which Perkins chaired.